No matter where Don Draper is, no matter who he is with, he will always be alone. He has to be: that’s what makes him so damn good at his job. After eight amazing years of peaks and (some) valleys, “Mad Men” drew to a close this past weekend. Just like with any revered show, the finale was up for some serious debate. But unlike “The Sopranos,” there was no debate that the creator didn’t even intend for us to have over life and death. At the end of the episode, Don, thousands of miles from Madison Avenue, meditates on a cliff overlooking the Pacific Ocean. Don lets out a big “ohm” and smiles. He looks happier than he ever has. Then suddenly, where there would be a cut to black, there is a cut to the famous “Hilltop” Coca-Cola ad from 1971. This quick cutaway has turned into a hell of a debate: did Don create this ad? Or did Matthew Weiner simply put it in to convey Don’s emotional state? The stakes are low, and there is no wrong answer here. If I were to choose, I would say I lean strongly towards the former category. Let me say it for the record: “Mad Men” pulled an “Inglourious Basterds” and altered history. It was Don Draper who created the Coke ad. I lean towards this explanation because even if it isn’t true, it represents what Don is really like as a person. If Don did come up with the ad, then there is a direct link between his meditative experience and creation of the ad. Don has been on a voyage of self-discovery since the series started. He is a man who switched identities with somebody in order to become the man he is today. He has done a lot of running away, usually to California, in order to do so. And as he sits on that hill, it looks like he has finally found himself. Well, if Don’s “aha!” moment was a Coke commercial, then he might just be some kind of sociopath. Or, to be a little nicer and put it in the words of Jon Hamm he is an “advertising man.” He might not have grown up amongst the WASPs. He might not have come out of the womb wearing boat shoes. But Don, truly, was meant to be in advertising. And it just makes so much sense that Don’s big epiphany would involve the creation of an advertisement. He is a creator of consumerism, but also taken much comfort in it; he always seems to inject his own life experiences into ad campaigns he works on. The pitch he comes up with that moves executives to tears in “The Wheel” (the season one finale) stemmed off issues he was having with his family at the time. He spent much of season five working on an ad that involved a couple fighting over ice cream. Then, at the end of season six, Don has a meltdown in front of Hershey over an idea that doesn’t accurately reflect Don’s childhood. It might sound weird to call advertising an art, but Don certainly has an artist’s need to recycle real life and turn it into a product that can be analyzed and somehow understood. Coming up with ads is a form of meditation for Don; it is how he gets closer and closer to achieving enlightenment. This is why Don is a tragic figure. His need to be an ad man will always conflict with the people who are close to him. It is in this episode that he realized that Betty, Sally, and Peggy didn’t need him anymore. Megan, meanwhile, didn’t seem to fit into the life plan that he wanted for her. Don has lived a life unlike anybody else’s. Even when he looked so suave and so cool, he was always a misfit. He will always accidentally push people away. He is a tragic figure. And that is what makes him so damn good at his job. Long Side Note: I will miss “Mad Men” a lot. That barely describes it. This is a show I have spent nearly one third of my life trying to figure out, and I will no doubt spend the rest of my life wrestling with him. Maybe some nice person will let me write a book about it one day. Not the book, but a book would be nice. I relate to this show in a strange way. Sure, it is about middle aged alcoholics who were around years before I was born. 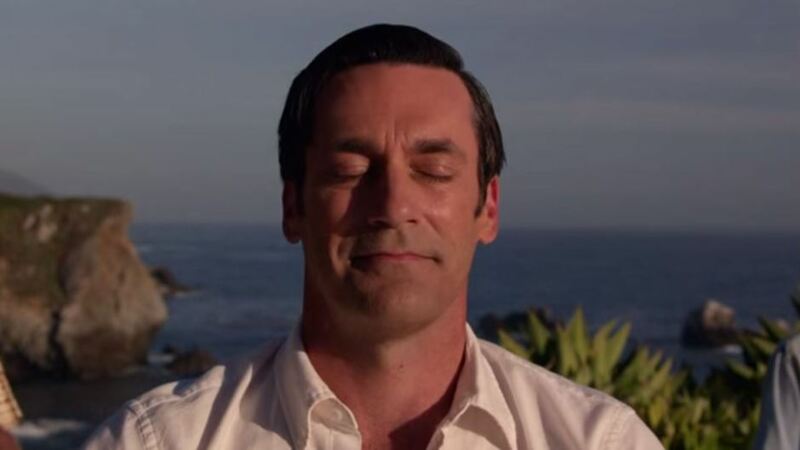 But what makes “Mad Men” stand out as a period piece is that it is mostly about feelings that are timeless. Existential dread? Check. Suburban ennui? You betcha. It is like “American Beauty,” but it doesn’t shove the themes right in your face. It actually makes you think. As a commuter, I walk out of Grand Central every morning and walk through Midtown Manhattan. I take a train that Pete Campbell would take back to his home in Cos Cob. I get into a station that Don would use to get back home to Ossining. Sure, these people aren’t real, but they feel real to me. This era sometimes feels more alive than the present. And sure, it was a terrible and backwards time for human thought. But with the music and the fashion, it was a time that was also very beautiful. “Mad Men” fully embraces the split of the luxury some people lived which blocked them from reality. So next time you happen to be in New York City, wander around Madison Avenue. Go down to Park Avenue and look up at the MetLife Building. Hum some Don Cherry or maybe some Nancy Sinatra. You’ll feel like you’re walking in the footsteps of the utter debauchery that once took place here. This entry was posted in Uncategorized and tagged AMC, Don Draper, Jon Hamm, Mad Men, Matthew Weiner on May 19, 2015 by ian0592.